In May 2009, Western Sahara Resource Watch demanded from the Russian government and the Murmansk Trawl Fleet to halt all fisheries in occupied Western Sahara. While we still await reply, the Russian giants keep trawling. On 31 May 2009, WSRW demanded the Murmansk Trawl Fleet to withdraw their vessels from the occupied territories. On 26 May 2009, WSRW outlined the political, ethical and legal controversies in such fisheries to President Medvedev, and demanded an immediate halt the current fisheries. 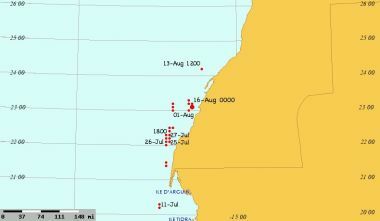 Admiral Starikov (IMO 8607218) and Kapitan Bogomolov (IMO 8607402) have at least since second half of July been trawling offshore the southern parts of occupied Western Sahara. The route to the top right belongs to Starikov, while the one below to Bogomolov. Also the Russian flagged 1.810 dwt cargo ship Zamoskvorechve (IMO 8721129), belonging to the Murmansk company Sovrybflot was observed in Dakhla end of July 2009. The Russian-Moroccan fisheries partnership agreement has been scheduled to be renewed prior to September 2009. WSRW demanded in the letter to the Russian president that the agreement must clearly exclude fisheries in the occupied territories. 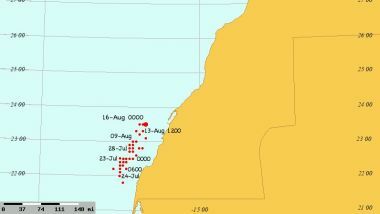 Morocco has no right to sign fisheries agreements covering the occupied parts of Western Sahara with foreign states. The photo above shows Admiral Starikov bunkering in Las Palmas in August last year, on its way to the occupied territories. See more photos of the Russian fleet here.